In Sikhism, cannabis is generally prohibited, as are tobacco and alcohol. However, some Sikhs particularly of the Nihang community use edible cannabis in a religious context. Fear of Thee, o Lord, is my bhang, and my mind the pouch in which I carry it. Intoxicated with this bhang I have abandoned all interest in worldly concerns. According to the Sikh Rehat Maryada, “a Sikh must not take hemp (cannabis), opium, liquor, tobacco, in short any intoxicant. His only routine intake should be food and water”. 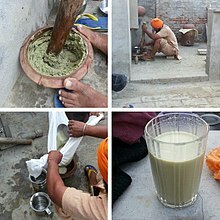 The Sikhs inherited the tradition of drinking bhang from Hindu culture, and the Sikh holiday Dasehra, in honor of the Third Guru, is celebrated with bhang. Contemporaenous British sources during the Second Anglo-Sikh War (1848–1849) believed that consumption of bhang contributed to the bravery of Sikh troops. In the modern day, bhang consumption (but not smoking) is commonly associated with the Nihang Sikhs, a sect who continue the Sikh warrior tradition, who consume bhang edibles or drinks as sukha or sukhnidhaan. Bhang is mostly used in India on the Sikh holidays of Holla Mohalla and Vaisakhi. At many Sikh temples, including Takht Sachkhand Sri Hazur Sahib Ji, the sukhnidhaan is offered as a holy food. In 2001, Baba Santa Singh, the jathedar of Budha Dal, along with 20 Nihang sect chiefs, refused to accept the ban on the consumption of bhang by the highest Sikh clergy. Baba Santa Singh was excommunicated for a different issue, and replaced with Baba Balbir Singh, who agreed to shun the consumption of bhang. ^ McLeod, (4 March 2004). Sikhs and Sikhism: Comprising Guru Nanak and the Sikh Religion, Early Sikh Tradition, The Evolution of the Sikh Community, Who is a Sikh?. OUP India. pp. 74–75. ISBN 978-0-19-566892-6. ^ Joginder Singh Sahi; Naindeep Kaur. An Encyclopaedia of Sikhism and Sikhs Abroad: It Includes Sikh Gurus, Sikh Rehyat Maryada, Life of Guru Gobind Singh, Maharaja Ranjit Singh, Etc., Sikh Martyrs, Gurudwaras in India and Abroad and Sikhs Abroad, with Coloured Photographs. Common World. p. 19. ^ Jeffrey Winterborne (2008). Medical Marijuana Cannabis Cultivation: Trees of Life at the University of London. Pukka Press. pp. 294–. ISBN 978-0-9550112-2-1. ^ E.L. Abel (29 June 2013). Marihuana: The First Twelve Thousand Years. Springer Science & Business Media. pp. 128–. ISBN 978-1-4899-2189-5. ^ Report, 1893-94. 1894. pp. 162–. ^ Joseph Thackwell (1851). Narrative of the second Sikh war in 1848-49. With a detailed account of the battles of Ramnugger, the passage of the Chenab, Chillianwallah, Goojerat, &c. … Second edition, revised with additions. Richard Bentley. pp. 181–. ^ Pashaura Singh; Michael Hawley (7 December 2012). Re-imagining South Asian Religions: Essays in Honour of Professors Harold G. Coward and Ronald W. Neufeldt. BRILL. pp. 34–. ISBN 90-04-24236-8. ^ “The ‘Sukhnidhaan’ or ‘Bhang’ (cannabis)”. Amrit World. Retrieved 19 November 2015. ^ Nihangs ‘not to accept’ ban on bhang. The Tribune. March 26, 2001. ^ No ‘bhang’ at Hola Mohalla. The Tribune. March 10, 2001.